Platform: Microsoft Xbox 360. Item Type: Xbox 360. Model: Xbox 360 S. Type: Power Adapter. Signs of wear can include aesthetic issues such as scratches, and discoloration. Condition: Used: Very Good. AC Adapter. Owner's Manuals. Tested for full functionality and works perfectly fine. Power Cable. 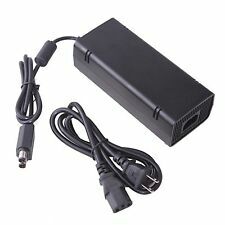 Replaces any broken or lost Xbox 360 Slim AC Power Adapter. Compatible Models：Microsoft Xbox 360 Slim. LED indicator light. One Power Cord. Output: DC 12V 10.83A 5Vsb 1A. Input: AC 100-240V 2A 47-63Hz. Works great. This is not compatible with Xbox 360 regular or 360 E.
1 x power brick for xbox 360 SLIM only. (Not for xbox 360 or 360 E or ONE model). AC Adapter Power: 135W. Microsoft XBox 360-S Slim Power AC Adapter Power Supply A10-120N1A Tested. Condition is Used. Shipped with USPS Priority Mail. Console Compatiblity: Microsoft xBox 360 SLIM. Change your power mode to energy saving and that should solve your problem! 1× AC Adapter. Cord Length: 6 ft. Output: DC 135W 12V 10.83A/5Vsb 1A. 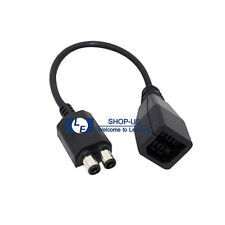 Ideal for replacing any lost or broken AC power adapter for Xbox 360 Slim consoles. A LED indicator light would display the power status of the Xbox 360 Slim system. Function as an original AC Adapter for Xbox 360 Slim consoles. XBox 360-S Slim Power AC Adapter Power Supply A10-120N1A . In Very Nice Condition. Works Perfect. 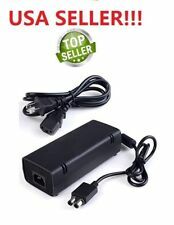 Replaces any broken or lost Xbox 360 Slim AC Power Adapter. 1 x AC Adapter for Microsoft Xbox 360 Slim. Microsoft Xbox 360 Slim. LED indicator light. 1 x Power Cord. Output: DC 12V 10.83A 5Vsb 1A. Input: AC 100-240V 2A 47-63Hz. Output: Dc 135w 12v 10.83a/5vsb 1a. Console Compatiblity: Microsoft Xbox 360 Slim. New generic AC Power Adapter compatible with Microsoft XBox 360 Slim Ideal for replacing any lost or broken AC power adapter for Microsoft Xbox 360 Slim consoles Function as an original AC Adapter for Xbox 360 Slim consoles A LED indicator light would display the power status of the Microsoft Xbox 360 Slim system Its auto voltage feature allows the adapter to be used worldwide, perfectly fit for all consoles worldwide LED indicator light . Note: Light shooting and different displays may cause the color of the item in the picture a little different from the real thing. Material: plastic. COMPATIBLE WITH XBOX 360 SLIM VERSION. OEM Original Microsoft Xbox 360 Slim AC Adapter Power Supply 110V Tested Working. Condition is Used. Shipped with USPS Priority Mail. $Product Description 135W 12V AC Adapter Charger Power Supply Cord for Microsoft Xbox 360 Slim Brick Features: · Brand new and high-quality · Replaces any broken or lost Xbox 360 Slim AC Power Adapter · LED indicator light · Voltage compatible worldwide · Input: AC 100-240V 2A 47-63Hz · Output: DC 12V 10.83A 5Vsb 1A · Power: 135W · Color: Black Compatible With · Microsoft Xbox 360 Slim · Replace Part Number：DE-X360-3206 What's in the box: · 1 x AC Adapter for Microsoft Xbox 360 Slim · 1 x Power Cord. Up for Sale is an Official Microsoft OEM Xbox 360 S Slim Power Supply PB-2131-02MX AC adapter, Condition is Used. Shipped with USPS (2 to 3 business days). Material: plastic Colour: black Package Contents: 1 X Game console power adapter Note: Light shooting and different displays may cause the color of the item in the picture a little different from the real thing. The measurement allowed error is /- 1-3cm. Brand Unbranded MPN Does not Apply UPC 191466884485 EAN 191466884485 ISBN 191466884485. Condition is Used, has been tested and works great! The cord has been tested and works great. Does not include the AC Adapter cord that plugs into the wall. This is a premium quality AC Adapter Cable for the Xbox 360 Slim. Compatible with all Xbox 360 slim consoles. Length: 1 ft.
12V 10.83 DC Output. Condition: Good (See Pictures). Official OEM Microsoft Xbox 360 S Slim AC Adapter Power Supply - Tested Working! This listing is for an official OEM Microsoft Xbox 360 S AC adapter power supply that is tested working and in very good condition. We have several available. Please see our photos for a representative example, and feel free to ask any questions you may have before making your purchase. 4 out of 5 stars - Official OEM Microsoft Xbox 360 S Slim AC Adapter Power Supply - Tested Working! 2 product ratings2 product ratings - Official OEM Microsoft Xbox 360 S Slim AC Adapter Power Supply - Tested Working! This AC Adapter Is Brand New And High Quality. With A LED Indicator Light, It Displays The Power Status For The Xbox 360 Slim System, And Its Auto Voltage Feature Allows The Adapter To Be Used Worldwide. When The LED Light Shows Green, Which Means That The Power Is Good, If It Turns To Orange, Which Means Standby, While It Is Red, Means Fault Alarm. Just For Xbox 360 But Not Xbox One; Please Make Sure Your Xbox Is 360 Slim System.Brand New And Good Quality.Input: AC 100-245V~2A,47-63Hz.Output: DC 12V - 10.83A / 5Vsb - 1A.Power: 135W.Color: Black.Material:plasticJust For Xbox 360 but not xbox one. Please make sure your xbox is 360 slim system.AttentionDo Not Place Adapter Into Hot, Humid Or Under Straight Of Sunshine.Do Not Mixed The Mess And Keep Surface Cle. This is a premium quality AC Adapter Cable for the Xbox. Original OEM Xbox 360 S Slim Power Supply Power Cord Component Video Cable. Condition is Used. Shipped with USPS Priority Mail. Sumlink XBOX360 Slim power supply. Suitable for XBOX360 Slim. Updated version. New in box, box does show some wear but item is new. Xbox 360 SLIM consoles only. Will not work with Xbox 360 OR XBOX ONE consoles. Material: plastic Colour: black Package Contents: 1 X Game console power adapter Note: Light shooting and different displays may cause the color of the item in the picture a little different from the real thing. The measurement allowed error is /- 1-3cm. Brand Unbranded MPN Does not apply UPC 191466884485 EAN 191466884485 ISBN 191466884485 Designer/Brand Unbranded. The Xbox 360 Slim AC Adapter replaces any lost or broken AC power adapter for the Xbox 360 Slim systems. Xbox 360 Slim AC Adapter. 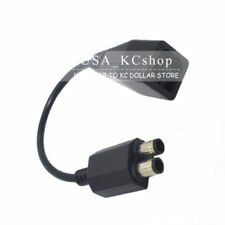 Replaces any broken or lost Xbox 360 Slim AC Power Adapter. LED indicator light. 1　x AC Cable. Length:1 FT. Do not dismantle. Weight：2.2 OZ. Microsoft XBox 360 S Slim AC Adapter Power Supply Brick A11-120N1A. In great used condition. Includes the brick and the cord that goes to the xbox. See photos. The Xbox 360 Slim power supply is a separate accessory that provides your 360 Slim console with the energy it needs to run your favorite games. This power supply is available in different formats and with various inputs. You can use eBay to find the Xbox 360 Slim power brick that meets your needs. What parts do you get with an Xbox 360 brick? Brick - This is the main unit that provides your Xbox 360 Slim console with power. It will sit next to your gaming system and light up when in use. Adapter - This cord fits into one end of your power brick and goes into a wall outlet to provide the energy that the power brick will send to the console. Cable - This cord fits into the opposite end of your power brick and connects it to the Xbox 360. Which AV connections can you choose? RCA - An RCA connector features three prongs in different colors that you can connect to the corresponding inputs on your monitor. HDMI - Your console features an HDMI port that can connect it to the HDMI input on your monitor. Can you get cables in different lengths? 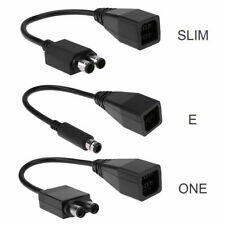 When you're shopping for your replacement Xbox 360 Slim power supply, you may wish to refine your search according to the cable lengths you want. If you use your console in a large room with open space, a cable that is longer than average may work for your needs. You can also choose a longer cable if you need to set the Xbox 360 Slim power supply far from the console for any reason. Common cable lengths you can find on eBay range from short lengths of up to four feet or longer lengths up to nine feet.